Bioactive restorative materials are a relatively new concept in dentistry. They are restoratives that reportedly release more fluoride than glass inonomers. In addition, these resins react to pH changes in the mouth by uptaking calcium, phosphate, and fluoride ions ultimately helping to maintain the chemical integrity of the tooth structure. This class of composites can be placed with or without a bonding agent, and is delivered via a dual-barrel automix syringe. A total of 183 restorations were originally placed (both anterior and posterior) and 96 of these restorations were recalled at one year. These restorations were placed with and without the use of a bonding agent after etching (Figure 1), and with one, two, three or four surfaces (Figure 2). 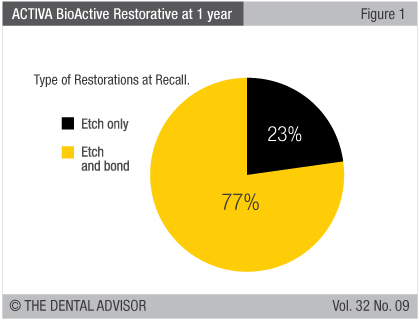 Patients reported some level of sensitivity associated with 5% of the 96 restorations recalled at one year. In three of these cases, patients experienced a moderate level of sensitivity immediately after placement and a decrease in sensitivity over time until they were asymptomatic. Two of these patients had restorations placed with bonding agent. One restoration was replaced due to an air bubble which was detected in a subsequent radiograph, and one was a very deep restoration which eventually needed root canal therapy. These conditions do not appear to be associated with the restorative material selected. No sensitivity was reported by patients at one year recall. The esthetics of the restorations was excellent (Figure 3). 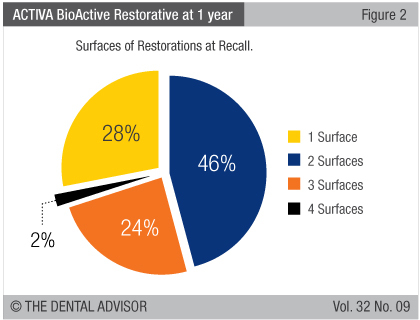 Ninety-six percent of recalled restorations received a rating of 5, whereas 2% received a rating of 4, and 2% received a rating of 3. Resistance to fracture and chipping were excellent. None of the recalled restorations exhibited any fracture or chipping. Resistance to marginal discoloration was rated as excellent (Figure 3). There were no observations of marginal staining at one year. Ninety-nine percent of the restorations exhibited no signs of wear (Figure 3). Only one of the recalled restorations exhibited some wear and received a rating of 3. Retention was excellent (Figure 3) – there were no debonds at the one-year recall. 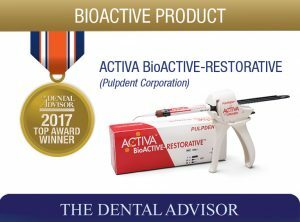 The ease of placement, finishing, polishing and final esthetics of ACTIVA BioActive-Restorative was rated excellent. The material performed extremely well at one year. Every category that was evaluated received a 96% or better rating. 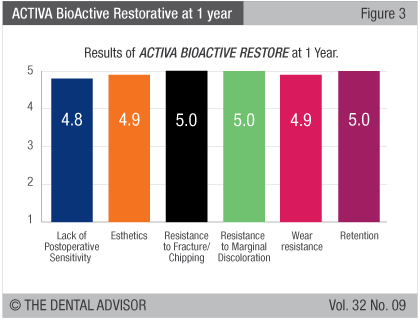 ACTIVA BioActive-Restorative received a clinical performance rating of 98% at one year.